I haven’t been doing a great job of teaching my kids Japanese so far but I think it’s important for me to do so they can communicate better with their grandparents and other relatives we might meet in the future. Don’t be sorry. This is an AWESOME prize. I would like to teach my 5 yr old daughter Japanese. Her grandmother was from Kobe. Unfortunately we lost her grandmother (my mother in law) about three years ago. It saddens me to know that my daughter will not know her grandmother’s Japanese heritage. I am trying to keep it alive for her the best I can. This would be an AWESOME help to get us started learning Japanese. PLUS to have it for tubby time would make tubby time that much more special. THANK YOU!!! I love so many of your posts and find them useful. I especially like your posts about holidays and links to Hiragana practice sheets and videos for kids. My husband and I are both Caucasian but we love Japan, lived there briefly, and we were living in Japan when we found out we were expecting our first child. We decided to teach our children Japanese because we feel it’s a great way to improve our own skills while helping our kids become world citizens with a better understanding of different races/cultures while also learning a valuable life skill. We love your website but, due to our kids’ ages, the best parts for us are your video links and book recommendations. Thanks to you, my boy adores Nontan! 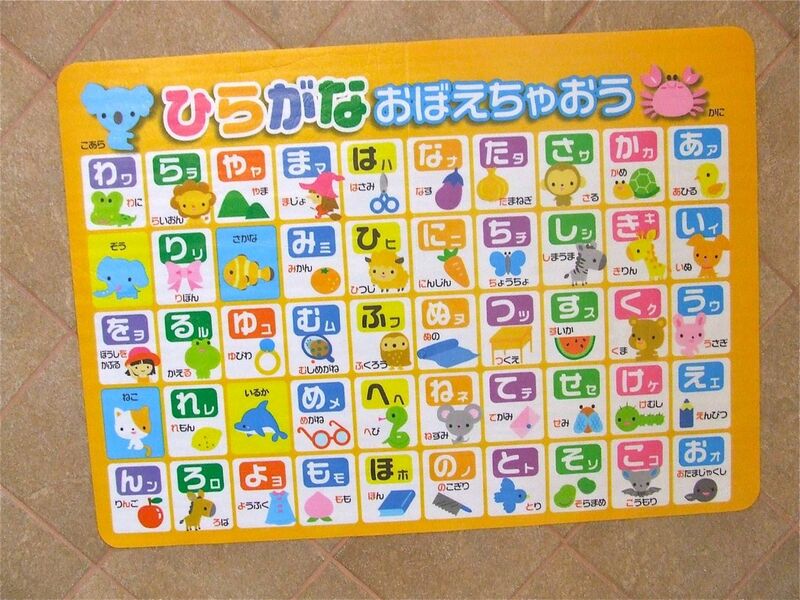 If we win the hiragana chart, he will be excited to learn in the tub where, currently, he loves to learn the alphabet. Yes, knowing more than one language/culture definitely gives you a better understanding of the world! Glad your boy loves Nontan, he is the best! I’m not a parent yet, but I’m trying to learn Japanese so I can permanently move to Japan to teach ESL. When I do start having kids, hopefully they’ll be living in the country. I want them to grow up at least bilingual (maybe trilingual since my beau is Puerto Rican) since it would give them such a massive headstart in life. As for most useful post, I’d actually have to say the kids videos. I love watching them, they’re super entertaining, and I can actually get a little out of them. I’m glad you like the videos! Good luck learning Japanese! I’m studying Japanese at University (so I can become a High School teacher) while raising my 18 month old son as a sole parent. I’m passionate about Japan, Japanese culture & the language. My son is Australian-Japanese and therefore I want to teach him about the Japanese culture & language as well. I find very helpful in your blog are the KIDS VIDEOS from Youtube. I download them and play them for my son so he is getting some language and culture exposure. You are awesome! Good idea to download the videos, I need to figure out how to do that. Then here is a video to download video’s from Youtube. This video is a bit outdated as Youtube and aTubecatcher have been updated. Hope this helps for Mum’s who want to store the video’s onto a PC/harddrive/ipad etc. You can also download just the music from the Youtube video using this program. It is a great tool to have because sometimes people take down their video on Youtube and it’s no longer there. I just accidentally found your blog while looking for Japanese educational materials for my son. I am happy that I found it! I want him (his first birthday is coming up in 2 weeks) to learn Japanese because he is half Japanese (I am Japanese). I think knowing Japanese would become important for him as he develops his identity. But I am struggling to teach him the language! Happy birthday to your son! Yes, it is hard to teach Japanese but you are right, it will help him as he develops his identity. Do you have Japanese friends in the area you could hang out with so he’s exposed to the language more? Hi Hatsuho! Welcome back!! Oh my – you really went so many cities in 2 weeks! I always go back for two weeks but I’ve never been to that many cities in one time! Seems like you all had a great trip. My kids also say they want to go back too. 🙂 We have similar chart, so please exclude me from the giveaway. It’s a GREAT giveaway!!! We packed a lot in to our trip since we don’t know when we’ll be able to go back! Thanks for the visit Nami! I’ve been looking for educational material for my girl but as I’m not fluent in Japanese yet, I wasn’t able to find them on my own. My little one is becoming 3 this month, and I’ve started learning Japanese with her (well not really, but I became serious then), as I was teaching her Japanese as her mother tongue since she’s a baby. She’s really skillful so far, she already knows how to read kana (not yet びょorきゃbut well, she’s only 3) She stopped dreaming in japanese lately, I must keep up and make it happen again ! I’d understand if you were thinking “well, if she knows how to read, she doesn’t need it!” but as you said, she enjoys checking everything she knows on colorful displays, and I’m sure she’d love your gorgeous chart, especially in bath. What a lovely idea! We’ve never been to Japan yet, so all I can have if from friends going there and getting us some おみやげ, and we’re working hard with しまじろう こどもちゃれんじ program and youtube/ニコニコビデオ and your blog. (becoming able to get japanese stuff in our lives and not “only” japanese language) and it enabled me to find the site with kanji sheets to work on, from a link on this karuta post page (because in learning books they teach how to write like computers and this site teaches the “real” deal, かんしゃします u__u). I’d like to go teach french or english in japan from summer 2013, but even when I’m there, I’m sure your blog will stay a perpetual source of insights. Thank you for all your hard work! If you’ve already taught her the kana, I am impressed, and would say you are doing a great job! Karuta is such a fun way to review Japanese. I hope you get to teach over in Japan… being immersed in the language is definitely the best way to become fluent! Thank you for the compliments! I love any video with Japanese children songs you post. I found them extremely useful for my half Japanese girls (aged 3 and a half and 2). They love them! And I always pass them on to other Italian mums like me, who have half Japanese children. Are there a lot of Japanese people living in Italy? Yes, there are. At least, I know there are many in Milan, the city where I come from. I appreciate the blog post about Omeyagi ideas–such great suggestions for when we travel to Japan this summer. I found your site a couple of months ago in hopes to help my son learn Japanese. We just moved to Cali two years ago and my son has started a Japanese Language Immersion Kindergarten class. My husband and I are love Japanese culture but we are both foreigners to it. We’re both from Canada and I speak English and French. We both believe learning a language opens doors to learning about new cultures etc. We also know that the younger you start the better it is to retain and speak. I’m amazed at how much he has already gotten from a couple of months of kindergarten and I’m happy we are exposed to your rich culture. But I fear because we don’t know the language at the rate he’s at we will not be able to help him in the future. I love your site because it allows me to read about important cultural days, hear and collect videos and just be up-to-date. Oh, I am jealous your son gets to attend a Japanese Immersion Kindergarten! I would love, love, love to have that for my daughter. If you ever really want something from here let me know and I will ship it to you! thanks Ashlee! 🙂 Wish Okinawa wasn’t so far away! My 3 kids who have dual citizen-ship in Japan and the US (my husband is from Matsumoto City, Nagano, Japan and I’m from Chicago, Illinois, we live in Los Angeles, California). Their grandparents, aunt and uncle and cousins in Japan only speak Japanese. We are trying to teach them Japanese and they go to Saturday Japanese school not only so they can communicate with their family in Japan but also they can understand their own Japanese heritage and culture. Who knows, they may want to go live and work in Japan someday! How lucky are your kids to have dual citizenship! They will be very grateful for your efforts to help them learn their Japanese language and culture in the future. Japan I feel is the most Western influenced East Asian Country/Culture, and therefore has a lot more accessibility to content and ideas. If my children can master Japanese, then they can engage in eastern thinking and gather ideas from another perspective other than western. Your posts on getting free activity sheets to practice hiragana, katakana is really great!